Six fridge-sized satellites, one to serve Rwanda, were launched into space from South America on board the European rocket yesterday. The flight will spark the beginning of a planned mega-constellation that will total 650 satellites aimed at creating global Internet coverage from space. The satellites belong to Virginia-based Company, OneWeb, which has been developing this mega-constellation for the last five years. OneWeb is targeting several markets for connectivity, including inflight Wi-Fi, maritime and government users, but also has a mission to bring Internet access to every school in the world. The company will start pursuing itsgoal by sponsoring connectivity for six schools — one each in Alaska, Rwanda, Nepal, Kyrgyzstan, Ecuador and Honduras — for 10 years. The Soyuz rocket carrying OneWeb’s first satellites also bore the logo of FIRST (For Inspiration and Recognition of Science and Technology), a nonprofit focused on instilling youth with a fascination for science and technology. The company’s vision is to use these satellites to provide internet connectivity practically anywhere in the world, with very minimal delay in signal. Current satellites that provide internet from space are situated over the equator, 22,000 miles high — a long distance that makes transmission and connectivity slow. 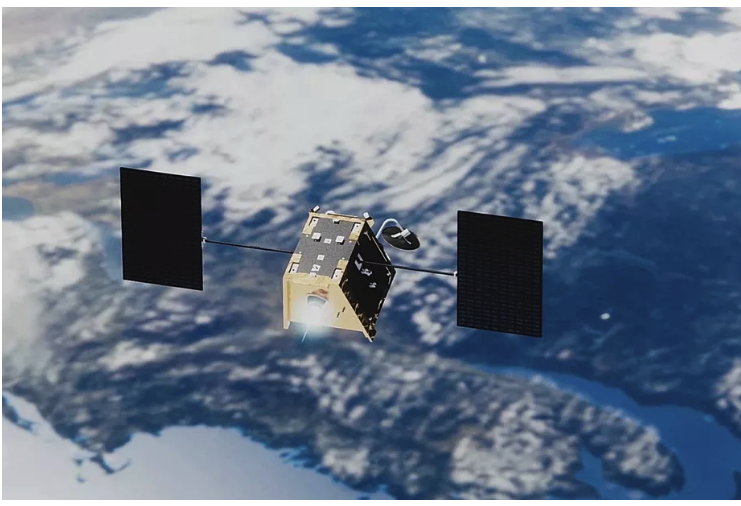 But from a vantage point of about 750 miles up, the planned OneWeb satellites will orbit from pole to pole in a synchronized dance over the Earth, transmitting signals to ground-based terminals. In theory, at least one satellite will be in sight of a terminal at all times, providing seamless coverage to most locations on the planet. The terminals, in turn, will transmit WiFi, LTE, and 3G signals to devices like cellphones and computers, even on the move. “No matter if you’re in a car or you’re walking or you’re in a plane, from the point of view of our satellites, you’re essentially standing still,” Adrian Steckel, OneWeb’s CEO, told The Verge. “And it’s handing off your signal from one satellite to another.” Steckel also envisions bringing coverage to schools and local governments in remote areas, where laying fiber is too expensive or just not viable. It’s a grand project not unlike that of aerospace rival SpaceX, which also plans to provide global internet coverage through a giant satellite constellation. SpaceX’s project, known as Starlink, is even larger in scope, though. The company wants to put up two constellations, equaling 12,000 satellites in total. In February of 2018, SpaceX launched the first two test satellites for Starlink in order to lay claim to part of the radio wave spectrum — the range of frequencies SpaceX can use to communicate with its satellites. With yesterday’s launch, OneWeb will do the same. It hasn’t been an easy road for OneWeb, and there’s still quite a long way to go. In 2017, the Federal Communications Commission approved the company’s plans to launch this first mega-constellation, but the launch of its first test satellites was periodically delayed. After this initial six satellites launch, OneWeb hopes to start launching the bulk of the constellation this fall. The plan is to send the satellites up in batches of 36 on top of Soyuz rockets operated by Arianespace, the same rocket that’s flying the satellites today. A total of 21 Soyuz launches will be needed to complete the first constellation. The company is backed by SoftBank, Richard Branson’s Virgin Group, Qualcomm, and Airbus, to name a few. Steckel won’t say the exact cost of the constellation, but he notes the company has already spent more than $2 billion on the project. Steckel says the initial 650 satellites will be more than enough for global coverage, but the company intends to launch even more spacecraft in the future. The capacity of the original constellation is going to be used up quickly by OneWeb’s signed customers, Steckel says, and they’ll need even more satellites to reach more people. Eventually, the plan is to put an additional 1,330 satellites into space at various altitudes, bringing the total number of OneWeb satellites to 1,980. The company is still waiting on approval from the FCC for this next class of spacecraft. For now, OneWeb will have just six satellites in orbit. The batch flew on Arianespace’s Soyuz rocket out of French Guiana at 4:37PM ET. The probes made it to orbit, and OneWeb will be testing them to see how they fare in space. The company has ground stations in Norway, Canada, and Italy, which will be used to communicate with the satellites. Data gathered from the tests may be used to improve the next round of satellites launching later this year.